Why are you paying income tax if you don’t have to? B.A.R. ATTORNEYS ARE FORBIDDEN FROM OFFICE! Are we preaching to the choir? How many of your friends know that Foreign Agent, Crown Temple B.A.R. Attorneys aren’t allowed to hold Offices of trust? How many know that the constitution is very clear about this? How many know that the original Article XIII in the Bill of Rights is missing? Is it really missing? NO!!! If a contract is created among those in agreement gets altered by one of the parties, is it still a contract? NO! What if the parties are held at gunpoint, under duress and threat of coercion, forced by a Military Coup D’Etat, to sign on to a new de facto corporate contract with a foreign banking conglomerate? What if the parties involved were not even a lawful, constitutional Congress? Well, that’s what happened! The real constitution has only thirteen Articles in the Bill of Rights. Originally there were ten. Three more were added, and that’s all, and Article XIII was the last one, and that’s the one that got left out of the new, fake constitution. Look carefully at the photo below!!! This is the Territory of Wyoming. The date is 1876. Article XIII is about “Titles of Nobility.” Article XIV is about “Slavery.” Article XV is about the Coup, deceptively known as the “14th” Amendment. AGAIN! 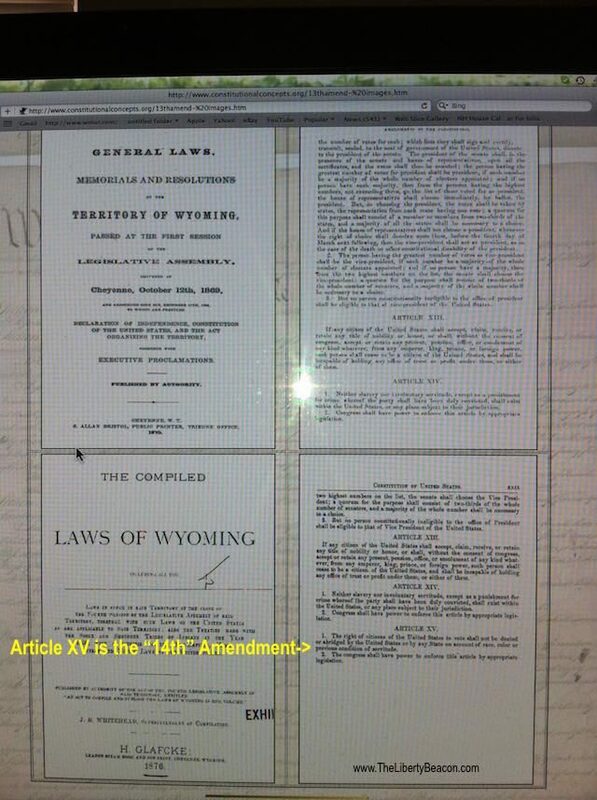 ARTICLE 15 IS THE 14TH AMENDMENT !??! There it is! When you look at the constitution that’s published today, it doesn’t look like this, does it?!? In fact, all the States’ publications listed the real Article XIII, including the States that didn’t vote to ratify it. Yes, it was ratified, and the proof is extensive. Just don’t listen to anything that comes from the lips of lying B.A.R. Attorneys. If you believe anything they say, you’re nuts, sorry. Trust in the fact that The Liberty Beacon has proven this abundantly. The specific lie under the spotlight now is that this is not “patriot talk” or nonsense. The de facto, THE UNITED STATES-The United States-and all derivatives thereof, was created unlawfully and the beast reared it’s head with the unlawful District of Columbia Organic Act of 1871. The fact that is was eliminated just a few years later bears the same level of unlawful status as it’s creation. The municipality was actually created on May 3, 1802, about a week after the Naturalization Act of 1802. “Municipality” can be accurately characterized as a continuing criminal enterprise, and for those who comprehend what’s being said here, The United States of Rome! The Territory of Columbia was then and is still today, under the stinking Vatican. The Zionist-Jesuit run Crown Temple B.A.R., Middle Temple, Inns of the Court, City of London, stinking Pirates called Attorneys/Brokers for the Curia and their Crown – Vatican – Swiss Banking Cabal. The B.A.R. of the Middle Temple run the Pirate Vessel called UNITED STATES! “Amicus Curia” – Friend of the Court? Really they’re B.A.R. occupied, continuing criminal enterprises. There is no lawful or legislative authority for Lawyers or B.A.R. Attorners/Brokers to occupy the courts. The Crown Temple B.A.R. (the Middle Temple occupies The United States), the Inns of the Court, CITY OF LONDON, is a foreign Corporation under FARA, the Foreign Agents Registration Act. Curia – (Catholic Church) In Roman Catholicism, a curia consists of a group of officials who assist in the governance of a particular Church. These curias range from the relatively simple diocesan curia, to the larger patriarchal curias, to the Roman Curia, which is the central government of the Catholic Church. Other Roman Catholic bodies, such as religious institutes, may also have curias. For example, the Legion of Mary has a rank called the Curia. It stands above the Praesidium but below the Regia. The Curia is responsible for several Praesidia. These curias are historically descended from the Roman Curiae, and they keep that name even though they now have very different functions. When the Roman Empire collapsed, many of the administrative functions previously done by the state were subsumed by the only solid institution left, which was the church. The Bishop and curia took the place of the government officials, often to the point of actually sitting at the same chair in the same building. The Curia therefore passed into religious hands, and afterwards changed functions many times but always keeping its traditional name, at least in those Christian denominations that keep a strong continuity with the Apostolic tradition. Diocesan Curia – Every diocese and eparchy has a curia, consisting of the chief officials of the diocese. These officials assist the diocesan bishop in governing the particular church. Patriarchal Curia – Patriarchates and Major Archiepiscopates of the Eastern Catholic Churches have an assembly called the Patriarchal Curia, which assists the patriarch or major archbishop in administering the sui juris church. The patriarchal curia is distinct from the diocesan or eparchal curia of the patriarch or major archbishop’s diocese or eparchy. Roman Curia – The administrative unit of the Holy See is called the Roman Curia, which assists the Pope in governing the Catholic Church. The Roman Curia includes the Secretariats, the Curial Congregations, the Pontifical Councils, Pontifical Commissions, the tribunals, and other offices. Can. 87 of the 1990 Code of Canons for the Eastern Churches. Enough of the truth! Let’s get back to the lies. As you read, THE UNITED STATES is run by the Jesuit controlled B.A.R., because it’s not the united states of America, that died back in the 1800s. It’s THE UNITED STATES OF AMERICA 4, in bankruptcy, with bankruptcy Administrators in Black Robes of Saturn/Satan, like wraiths, Attorneys/Brokers robbing you of your very existence, pretending to be a Nation of the people, by the people, and for the people. (Breitbart) New York federal prosecutor Loretta Lynch, the new nominee for attorney general, has a career filled with high profile cases — and she was a member of Bill Clinton’s defense team during the 1992 Whitewater corruption probe. As he made his announcement Saturday afternoon, Obama called the two-time U.S. Attorney for the Eastern District of New York a “tough, fair and independent” lawyer. “It’s pretty hard to be more qualified for this job than Loretta Lynch,” Obama said. Indeed, the prosecutor has a long career built of some high profile cases but there is one case Lynch was involved in that few are talking about. Lynch was a part of Bill Clinton’s Whitewater probe defense team in 1992. The CROWN TEMPLE B.A.R. ATTORNER GENERAL LORETTA LYNCH, defense ATTORNER for CROWN TEMPLE B.A.R. ATTORNEYS BILL and HILLARY CLINTON, appointed as ATTORNER GENERAL by CROWN TEMPLE B.A.R. ATTORNER BARRACK OBAMA, married to CROWN TEMPLE B.A.R. ATTORNER MICHELLE (MICHAEL?) OBAMA, wouldn’t prosecute FELLOW B.A.R. ATTORNER HILLARY thanks to the help they got from CROWN TEMPLE B.A.R. ATTORNER and FBI DIRECTOR JAMES COMEY, as he claimed no Mens Rea, or no criminal intent. Attorneys are considered FOREIGN AGENTS under the FOREIGN AGENTS REGISTRATION ACT (FARA) and are SUBJECTS of the B.A.R. ASSOCIATION. TLB has other, above the fold articles, videos and stories available by clicking on “HOME” at the top left of this post. Never miss a new post, sign up for E-Mail alerts at the bottom of the Home page and get a link dropped right to your in-box. The Liberty Beacon contains copyrighted material the use of which has not always been specifically authorized by the copyright owner. We are making such material available to our readers under the provisions of “fair use” in an effort to advance a better understanding of political, economic and social issues. The material on this site is distributed without profit to those who have expressed a prior interest in receiving it for research and educational purposes. If you wish to use copyrighted material for purposes other than “fair use” you must request permission from the copyright owner.